Joseph Schooling’s historic win in the Rio 2016 Olympics kicked off a wave of media publicity. It also resulted in multiple brands riding on the brand-wagon, with some brands doing better than others. However, do you know what this phenomenon is called? One of the most oft-used strategies in content and social media marketing, newsjacking allows you to achieve a phenomenally quick growth in web visitorship and views riding on a hot news item. According to HubSpot Blog, there is a small window of opportunity for one to newsjack successfully. It may range from a few hours to a few days, depending on how big the news item is and the amount of public and media interest in the subject. To maximise the benefit of newsjacking, we should interject as soon as the news starts to break and gain traction. When such opportunities arise, dive in and swim to meet the big surf so that you can ride its crest. This usually takes place as soon as the event takes place before it hits mainstream media in a big way. By piggybacking on a breaking news story, you’re able to benefit from the momentum of the story as it unfurls. What are some examples of newsjacking in action? Well, the Diner en Blanc case in Singapore a few years ago was one such example. 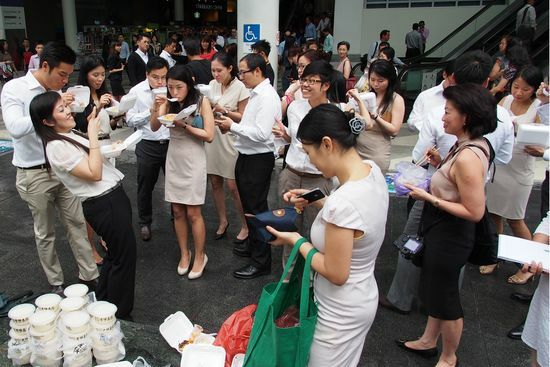 Following the incident, several different parties have organised their own thematic “pop up” dining events including the Make and Eat Tau Huay Day. The most successful of these spin-offs was probably mrbrown’s Makan Day at Raffles Place. Over in the US, Steve Wynn, owner of the luxurious Encore Wynn Hotel in Las Vegas (where Prince Harry got famously sloshed and naked), seized the opportunity of generating publicity by capitalising on the His Royal Highness’s moments of indiscretion. Apparently, he publicly waived the tens of thousands of dollars of hotel bill that the young member of royalty owed to the hotel chain. According to Scott, this act alone got Wynn into 3,657 stories by Google news count! How does one newsjack a breaking news event or riding trend successfully? Here’s a useful six step guide from HubSpot blog that I’ve paraphrased below for your reference. Set up alerts via RSS feeds, Google alerts, Twitter alerts or other social media monitoring tools (eg BuzzSumo). Use the specific keywords or topics that are of interest to your business. These will help you to monitor any impending newsjack items. Beyond this, knowing what’s hot and trending in the news may also help. A great recent example (August 2016) was the Rio 2016 Olympics. Check the keyword search volume on Google AdWords Keyword Planner or other keywords research tools. Find out which of your targeted keyword phrases have a higher search volume around your topic of interest. Yes, it’s one of the cardinal skills in Search Engine Optimisation (SEO) and social media optimization here. Read as much as you can about your search topic. Ensure that you know what has already been written about the news story, and how you can develop an original and credible angle. Write quickly, but accurately. Yes, time and tide waits for no man and here, and speed is of the essence. Differentiate yourself and present something unique, different and fresh which is of interest to your audiences. If possible, inject something humorous and light-hearted too. Finally, get the word out. This is probably the most straightforward for those with an existing network on Facebook, Twitter, RSS feeds and other online channels. Where possible, see if you can seed the newsjacked story amongst social influencers, who could help you to get the word out in their extensive networks. When doing so, however, you need to be sure that your content has sufficient quality and traction to spread. If necessary, you may wish to also boost your post through online advertising. While negative news can present opportunities for piggybacking, you should not capitalise on major disasters, calamities, personal misfortunes or deaths for your own gain. There are numerous examples of companies who tried to do so but encountered a huge backlash instead. Don’t simply ride the “Gangnam Style” bandwagon just because it’s such a huge YouTube hit spawning tonnes of parodies. Ensure that you are well equipped to newsjack a trending item. 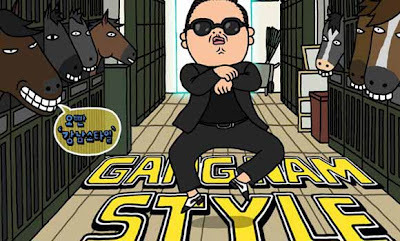 With two left feet and an inherent geekiness not made for video, I’m certainly not taking that chance by pretending to be like Psy! I would like to add that being credible also means being authentic and tasteful. Do not merely ride on a trend just because everybody is talking about it. Yes, trying to do it too late would result in you missing the boat. PR Daily recommends a 48-hour window (a bit longer for trends). An example which I did recently (in January 2016) was a post on I wrote on Nikon’s Photo Contest even as the incident was developing. That occurred barely 12 hours after the incident. 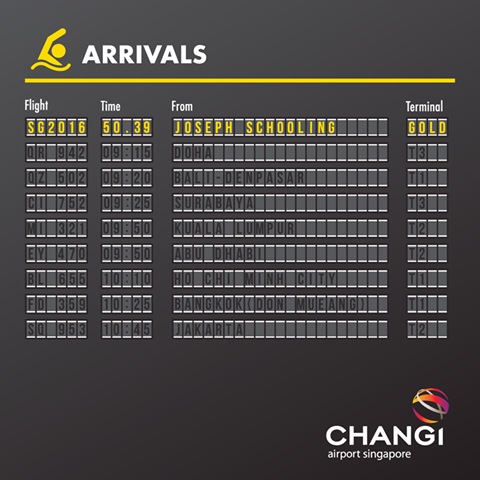 More recently, Changi Airport successfully newsjacked Singapore’s first Olympic Gold medalist Joseph Schooling’s record win in a record time of barely 15 minutes after the announcement (read here to learn about how they did it). This means creating the right headlines so that you can catch attention and employ all the PR tricks you can muster. Doing so successfully requires you to understand the art and science of creating contagious content. This is probably the most useful tip on ethical newsjacking. You need to show that your business offers something of value and relevance rather than just capitalising on a “cheap shot” at fame. Do also consider how your actions will influence your brand identity. While you may relish the opportunity to grab the limelight (and web visitors) during a hot news period, doing so too frequently may “train” your readers to only want to read the latest buzz from you all the time. 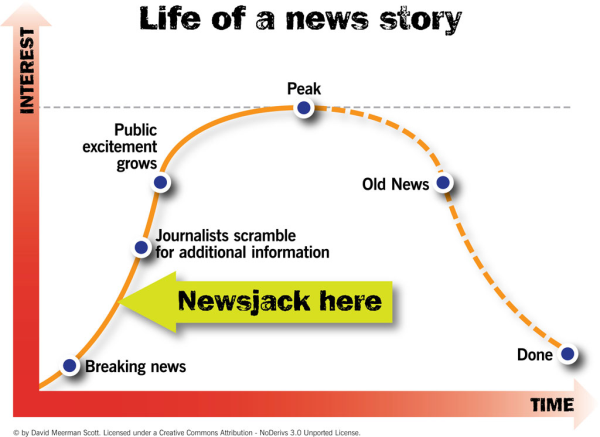 Do you feel that newsjacking is an ethical and sustainable PR strategy? If not, why not? Thanks for spreading the word. Newsjacking is indeed a great way to generate attention. What changed recently is that Google now indexes in real-time. That allow a timely blog post to be seen by journalists as they search for more information on a topic. Real-time is the key here. Yet nearly all PR people are in campaign mode rather than real-time mode, so those like us who understand newsjacking have an advantage. Thanks so much for your comment David! I’ve been a great fan of your work and would love to connect with you. Real-time is truly the key as you’ve highlighted. Unfortunately, most PR outfits in organisations or agencies aren’t fitted to deal with this new reality. More often than not, publicists are more adept at following a scripted way of working as opposed to nimbly adapting their craft as the situation unfurls. This is probably the most useful tip on ethical newsjacking. thanks for sharing..